Conservationists have won a second battle against developers who wanted to build on disused mill ponds and a former allotment site. Kirklees Council last year rejected a planning application by Bloor Homes to put 28 houses and flats on land between Newsome Road, Hart Street and Naomi Road in Newsome, next to Newsome Mill. The company then launched an appeal with national body the Planning Inspectorate. But inspector Anthony Davison has thrown out the bid, saying the impact of the development would have been unacceptable. Action group Newsome Ward Community Forum was instrumental in the battle to preserve the land. Marketing and campaigns co-ordinator Diane Sims said: “We are pleased that the inspectors have confirmed what Newsome residents have been saying all along. 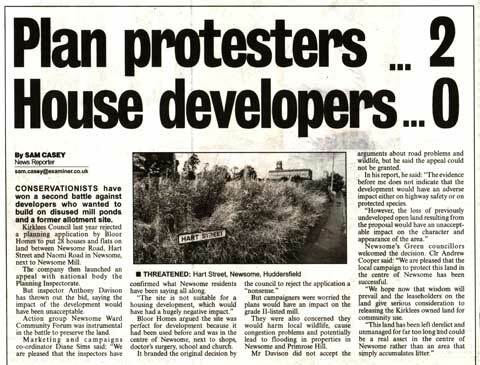 Bloor Homes argued the site was perfect for development because it had been used before and was in the centre of Newsome, next to shops, doctor’s surgery, school and church. But campaigners were worried the plans would have an impact on the grade II-listed mill. They were also concerned they would harm local wildlife, cause congestion problems and potentially lead to flooding in properties in Newsome and Primrose Hill. Mr Davison did not accept the arguments about road problems and wildlife, but he said the appeal could not be granted. In his report, he said: “The evidence before me does not indicate that the development would have an adverse impact either on highway safety or on protected species. Newsome’s Green councillors welcomed the decision, Clr Andrew Cooper said: “We are pleased that that local campaign to protect this land in the centre of Newsome has been successful. “We hope now that wisdom will prevail and the leaseholders on the land give serious consideration to releasing the Kirklees owned land for community use.